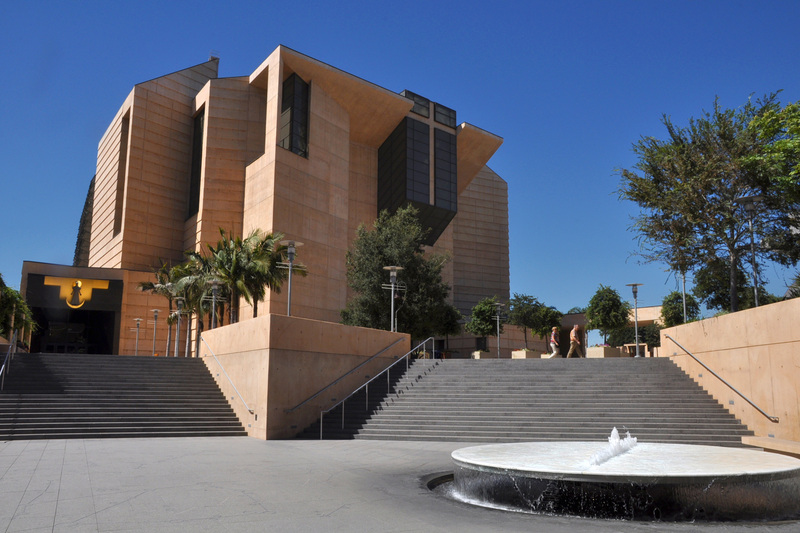 Visiting L.A.’s newest art museum? 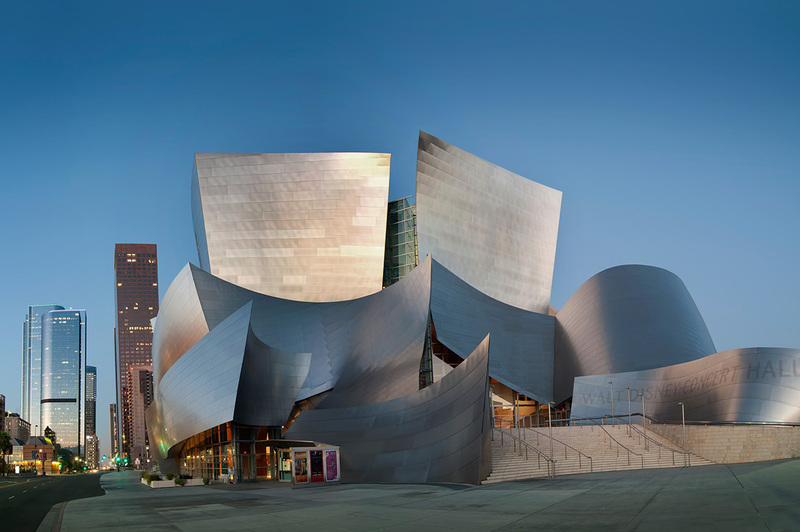 Here are some other things to do by the Broad, on and around Grand Avenue. 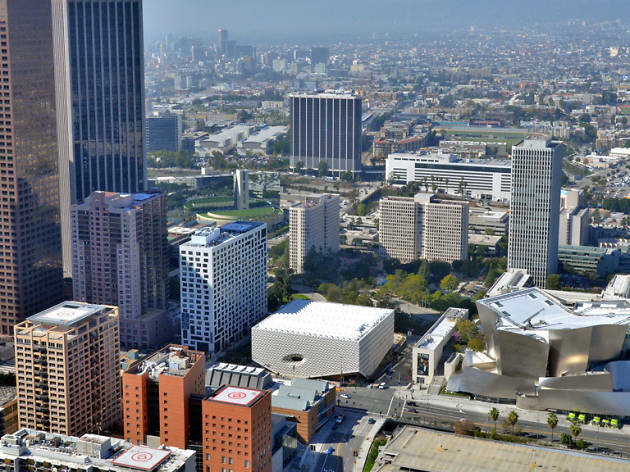 You could spend all day—or, realistically, about an hour—exploring all of the contemporary art masterpieces at the Broad. Eventually though, you’ll have to leave the museum and look for other things to do. 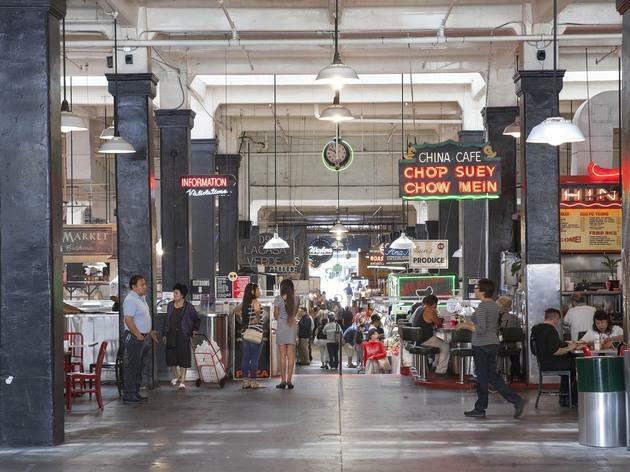 Make the most of your trip Downtown—and that lucrative parking spot—and plan a day around your visit. 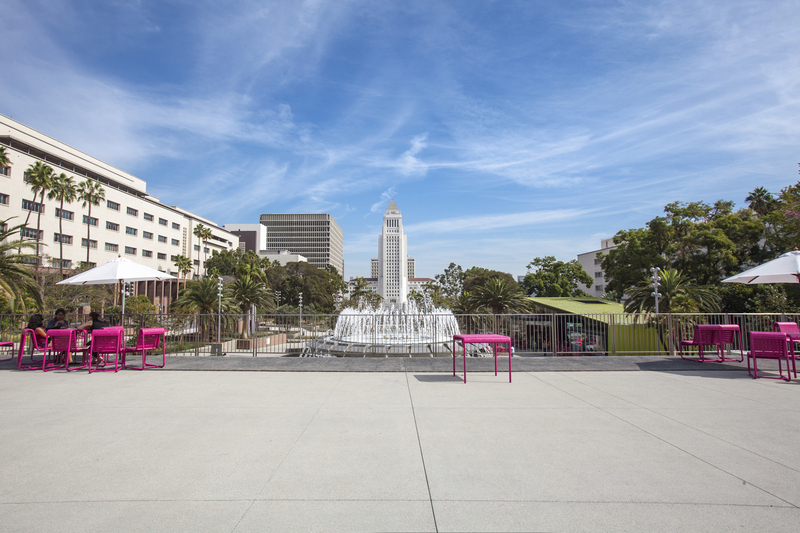 Get to know Grand Avenue and Bunker Hill with a stop at these 10 things to do by the Broad. 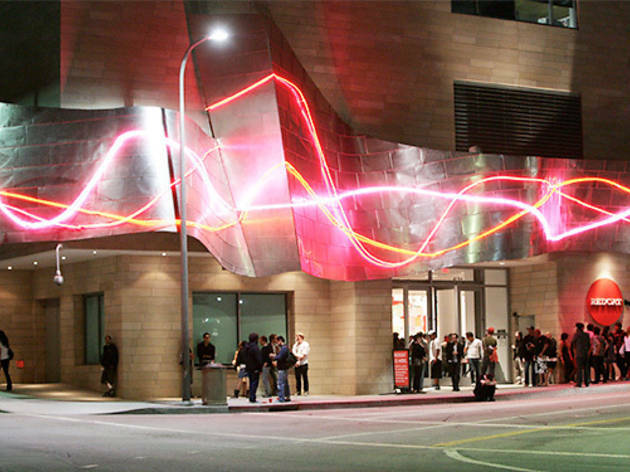 Just across the street from the Broad, this independently-run performing arts school (which contains a performing arts library, three concert halls and a cafe) continues to serve the community with a yearly program of more than 300 concerts and recitals—many of which are free—by faculty, students and guest artists. 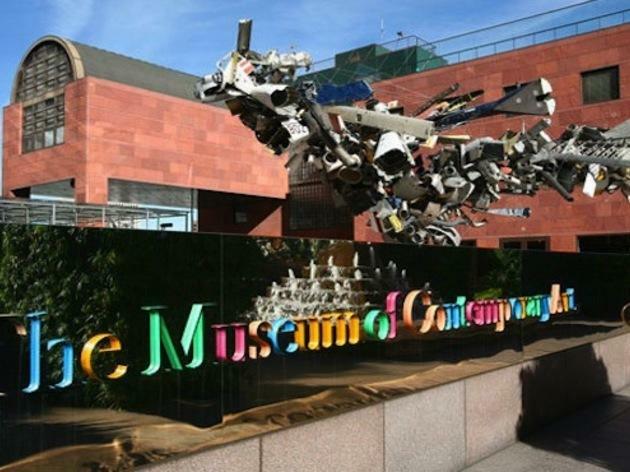 If an entire museum dedicated to contemporary art didn't satisfy your hunger for post-war artwork, why not visit another one? 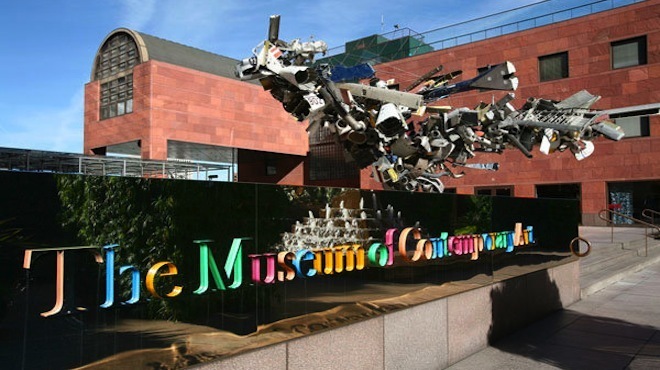 The main branch of L.A.’s Museum of Contemporary Art (MOCA) houses thousands of artworks crafted from 1940 until now. 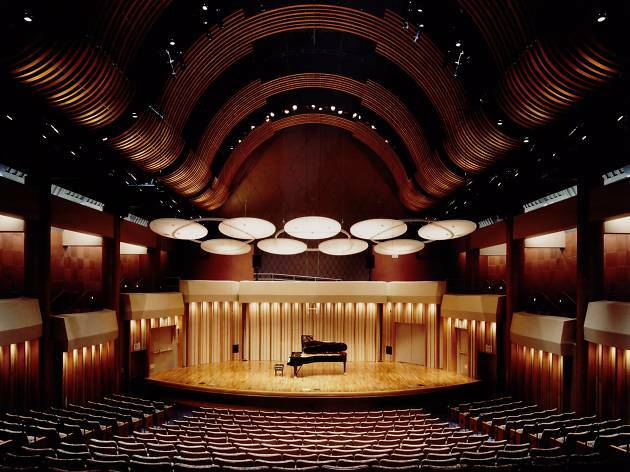 Spend some time in the humbly sized space checking out contemporary pieces from lesser-known artists, punctuated by sightings of work by Mark Rothko and Jackson Pollock. 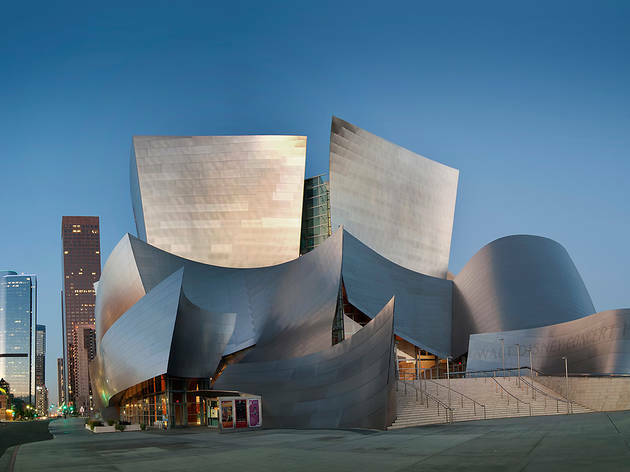 Designed by Frank Gehry, Grand Avenue’s architectural icon is the home of the LA Phil. 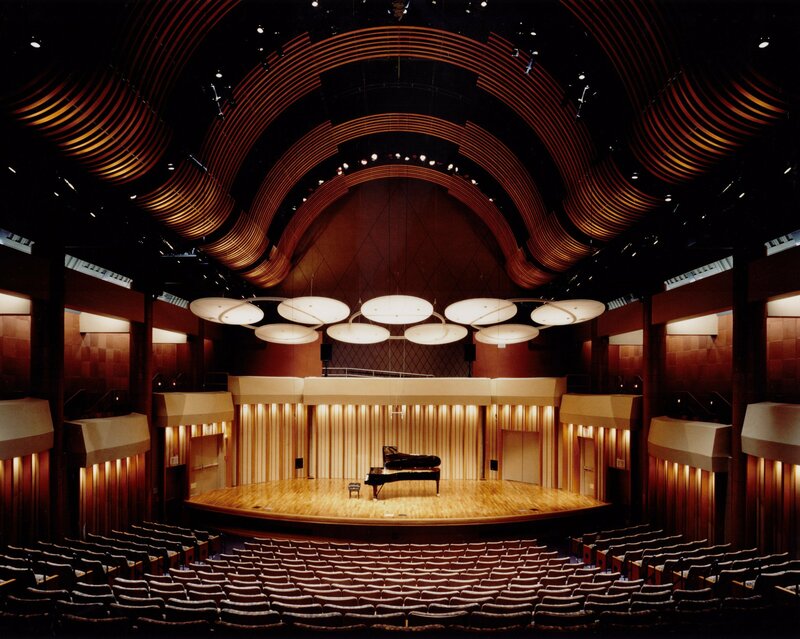 See Gustavo Dudamel conduct the orchestra in the hall's 2,265-capacity auditorium, or at the very least, take a walk around the building’s hidden gardens. 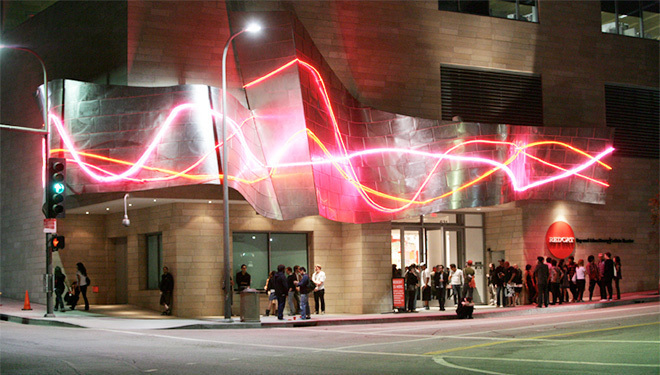 Located in the back of the Walt Disney Concert Hall complex, the prestigious CalArts-owned multipurpose space leads the way in compelling avant-garde performances in dance, music and theater—not to mention the exhibits mounted in the center’s 3,000-square-foot gallery. 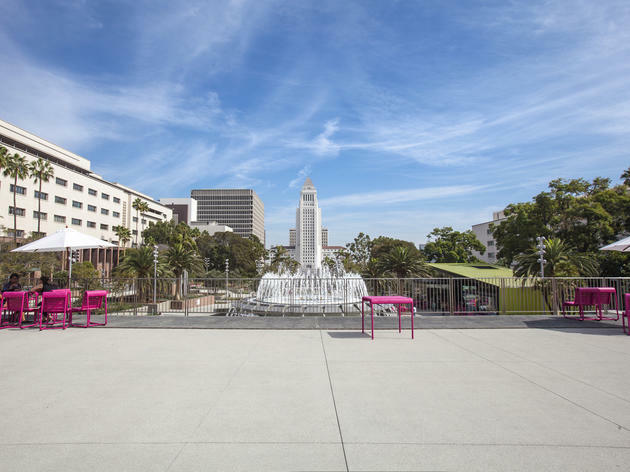 With its most uphill side brushing up against Grand Avenue, this renovated park sits just over a block away from the Broad. Dotted with fountains, picnic lawns, bright pink benches and plenty of nooks from which to sit and people-watch, Grand Park is a bright urban oasis that proves the city has a sense of romance. The park plays host to performances, gatherings and other community events. The Center Theatre Group programs two of the halls that make up DTLA’s original cultural complex. 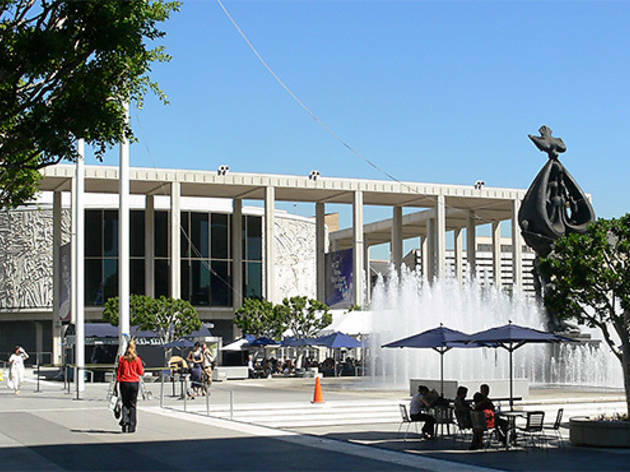 At the north end, the Ahmanson Theatre presents pre- or post-Broadway fare, while the smaller Mark Taper Forum stages a wide range of new plays. 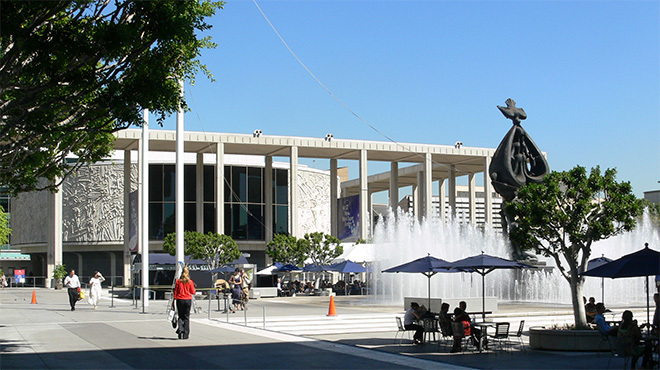 Also part of the Music Center, the grand Dorothy Chandler Pavilion is home base for L.A. Opera as well as occasional concerts and dance events. 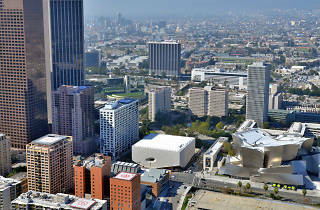 Last, but certainly not least, the Center also includes the previously mentioned Disney Concert Hall. 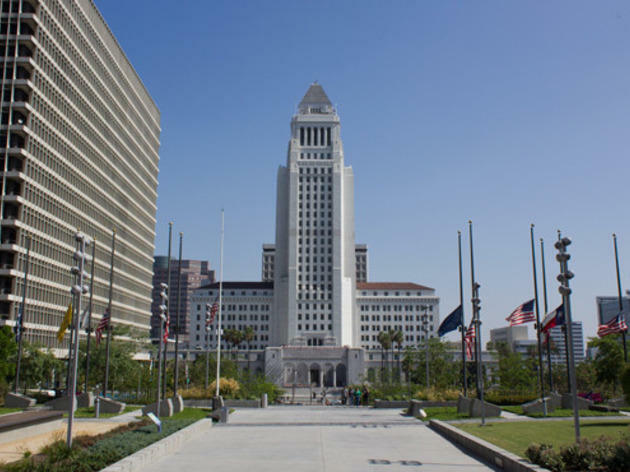 The grand, white concrete tower has stood tall as a city icon since 1928, and today it’s the easiest way to take in an elevated view of Downtown and beyond. 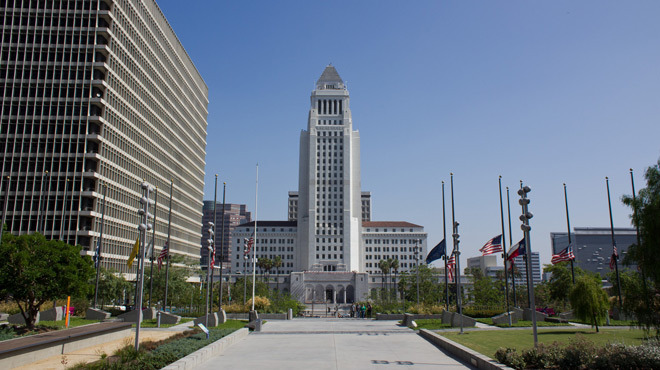 If you’re visiting the Broad on a weekday, make sure to walk down the hill to City Hall’s public entrance on Main Street. From there, make your way up to the 27th floor observation deck. 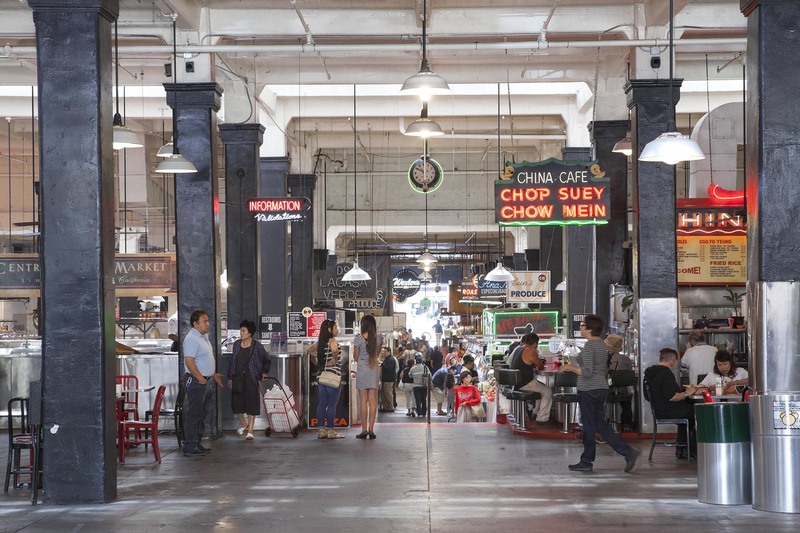 You’ll find this European-style food hall a few blocks downhill from the Broad on the ground floor of the iconic Homer Laughlin Building, where it’s been operating since 1917. Old Mexican- and South American-themed stalls offer treats like pupusas, carnitas tacos and aguas frescas alongside new-school favorites like Eggslut, Belcampo Meat Co. and Sticky Rice. 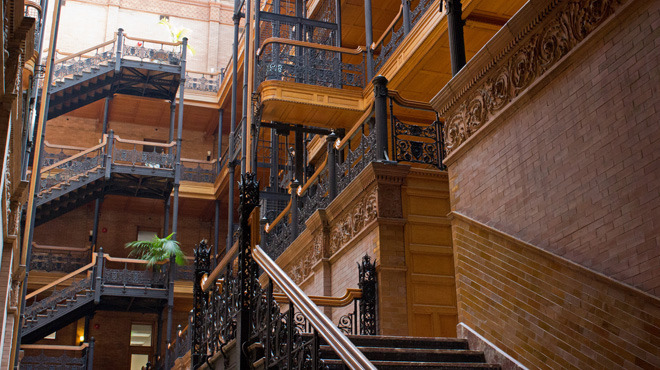 Walk into this brick building across from Grand Central Market and you’re greeted with a stunning, light-flooded alley of wood, iron and brick. You’ll have to do all of your gawking from the ground floor (and half a flight of stairs) as the rest of the building is private office space. 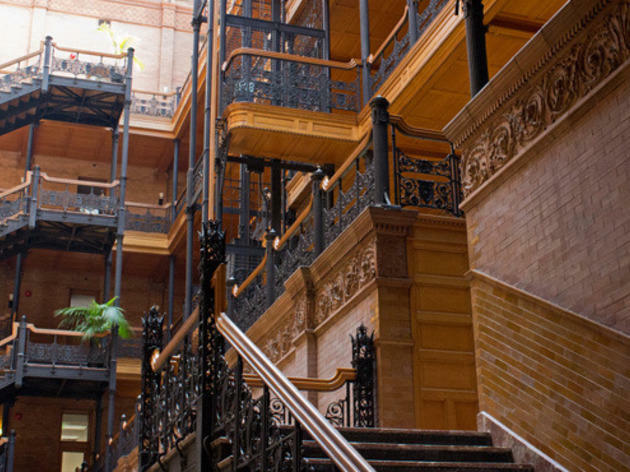 History buffs will appreciate its place as Downtown’s oldest commercial building (1893); movie buffs will recognize the zigzagging staircases from climax of Blade Runner. 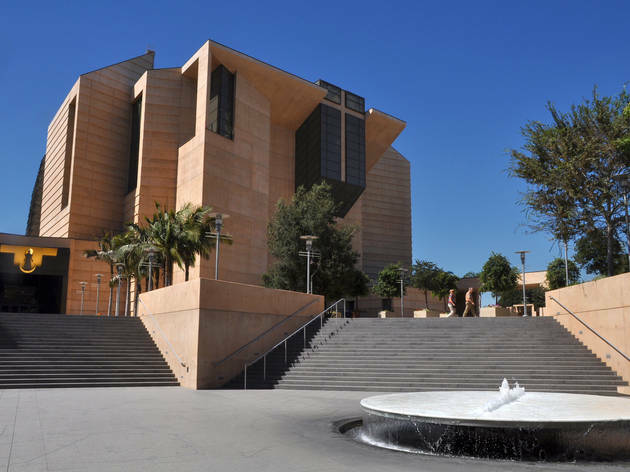 When the Northridge earthquake devastated the Cathedral of Saint Vibiana—a stunning sanctuary in its own right—the Catholic Church needed to find a new home in L.A. The result is a deconstructed fort with an imposing but quietly beautiful interior that’s fit for ancient kings—thanks to a budget as soaring as its faceted ceiling.